This new game from Alawar Entertainment is for those who like tickling their senses and emotions, especially one emotion in particular - fear. 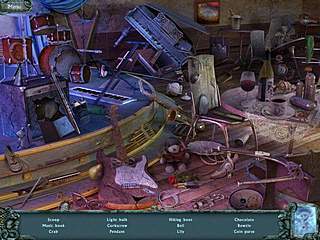 Twisted Lands: Shadow Town is a hidden object adventure game that will take you to a wide range of all kinds of places in search for your woman. The game is perfect in some areas, but helplessly annoying in the others. For example, the graphics and sounds are absolutely gorgeous creating an absolutely required atmosphere of horrifying discomfort. The high quality graphics depict details in every scene you are going to visit. And you are going to visit many of them in very different places like a spooky mension or jail. Most of the places are not where you would ever want to be in reality, but they are perfect for a game like this. At the same time it becomes kind of annoying when you have to visit them way too often. And it is not like when you need to go back to one of the scenes where you have just been. 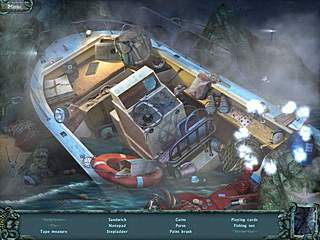 Later in the game it seems that most of the time is spent on going back and forth just to pick up something in oder to proceed. Another thing that serves well only as a means to make the play time longer is the mazes that you need to play every once in while. Completing a maze is no challenge at all. And even if it will be for some, the hints system works flawlessly for them. The story of the game is deep and full of information and details if you are one of those who actually read it all. It puts everything together quite well allowing you to play as a very interesting character. He is a deep-sea treasure hunter, one of those who don't care what others think about him or what he does. But he is ready to take any risk in order to save his beloved Angel (doesn't her name make their story even sweeter?). The searches for items are going to be where you will spend most of your time. They are though conventional very entertaining because of the great graphics and the difficulty level. And the challenge is not like when it is near to impossible to find the items, but rather making you want to use all of your experince to find all of the items. 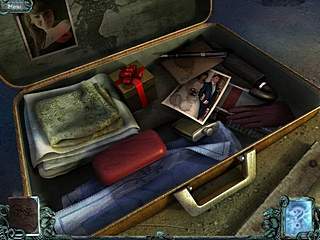 The collector's edition of the game features a built-in walkthrough and a bonus chapter set on the same desolate island. The game is definitely a great example of a high quality HOG. As to the flaws, their size is different for everyone. This is Twisted Lands: Shadow Town review. Download this game here.